Common Paint Removers Contain Deadly Chemicals : Shots - Health News A chemical in common paint removal products is implicated in more than 50 deaths. Even though a federal ban has been delayed, some major retailers are voluntarily taking the products off shelves. 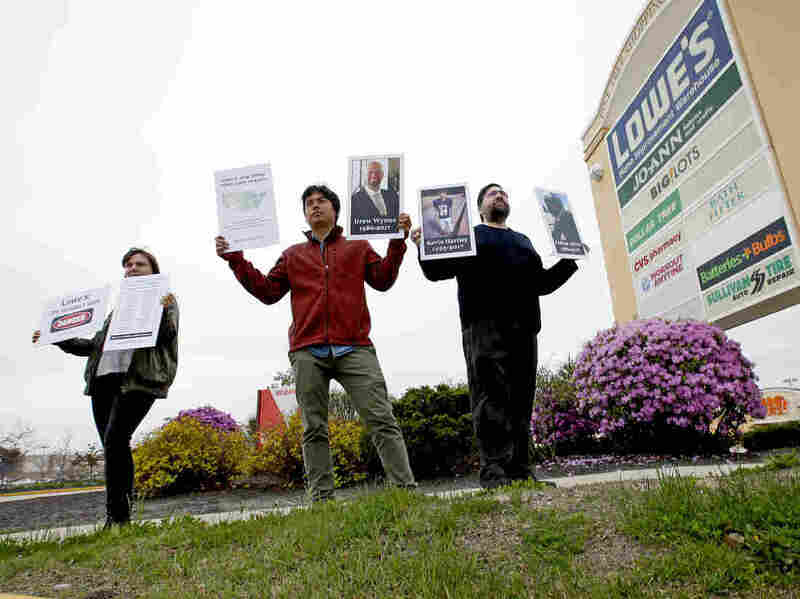 Protestors holding pictures of people who died from use of paint removers, including Drew Wynne, protest outside a Portland, Maine, Lowe's store on May 10, 2018. They were trying to persuade the retailer to stop selling paint strippers containing methylene chloride. In October 2017, Drew Wynne collapsed inside a walk-in refrigerator at his coffee business in North Charleston, S.C. By the time his business partner found him crumpled on the floor, Wynne was dead. He had suffocated on a chemical called methylene chloride. The 31-year-old's death is one of dozens blamed on popular paint removers sold under the brand names Goof-Off, Strypeeze, Klean Strip and Jasco among others. In recent months, some retailers have said they will stop selling products that contain methylene chloride, also known as DCM, and a second chemical, N-Methyl-2-pyrrolidone, or NMP. But under the Trump administration, federal regulators have repeatedly delayed a ban that has been in the works for years. The EPA began a risk assessment of methylene chloride in 2014. In January 2017 the agency proposed banning the use of methylene chloride and NMP in paint removers. In the proposed rule, the agency wrote that the chemicals posed "unreasonable risks" to consumers. Since 1980, more than 50 deaths had been attributed to methylene chloride, according to an investigation by the Center for Public Integrity and Slate. But the proposed rule has yet to become an actual ban. Methylene chloride manufacturers opposed it, and in public comments in the spring of 2017, the Halogenated Solvents Industry Alliance urged the agency to delay it, saying the regulation would have a "devastating impact on consumers and small businesses." A spokesperson for the industry group, Faye Graul, declined to comment for this story, and the major U.S. manufacturer of methylene chloride, W.M. Barr, did not respond to interview requests. Today, it's still legal to sell products containing both chemicals. Health and safety experts caution consumers to avoid using them — especially indoors. Two days after her son's memorial service, Drew's mother Cindy Wynne saw a story on the front page of the The New York Times that said the EPA was no longer pursuing bans on a handful of chemicals it had determined were hazardous or deadly — including methylene chloride. "We struggled with that," Cindy remembers. "They weren't going to move forward, even though the ban had been proposed [and] the research had been done." 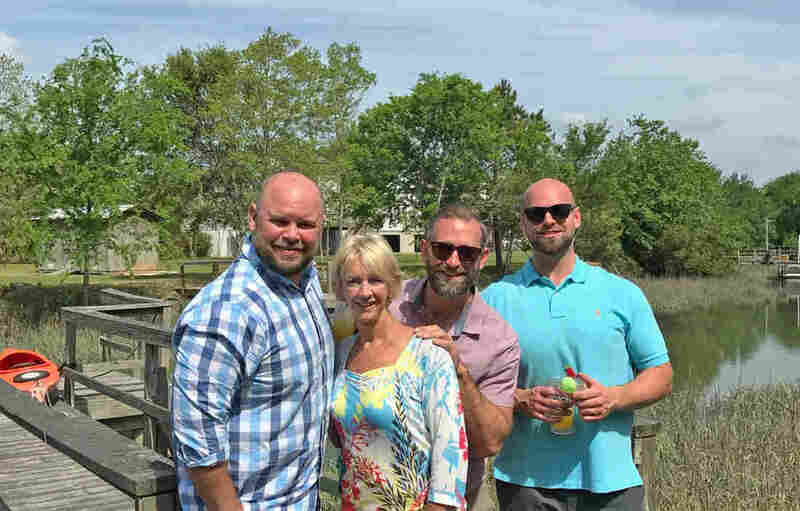 Drew Wynne (right), and his mother Cindy, with brothers, Brian and Clayton Wynne pose for a family picture at their home in South Carolina in 2017. He died that year from exposure to a paint remover. This spring, Cindy Wynne traveled to Washington, D.C. with another mother whose son died of methylene chloride exposure. South Carolina's Congressional delegation had helped set up a meeting with then-EPA administrator Scott Pruitt. Wynne's grief was still fresh, and she was unsure what to expect from Pruitt, but "we felt like we had a very positive meeting," she remembers. Two days later, the EPA announced it intends to ban methylene chloride. "We were elated. We were believers," says Cindy. "We're making a difference. And then nothing happened." Months dragged by. Pruitt resigned amid an ethics scandal. Today, the ban is still pending. This October, budget documents released by the Trump administration suggested a rule would be finalized sometime in December, but didn't announce a specific date. And the second hazardous chemical, NMP, is no longer included. An EPA spokesperson wrote in an email to NPR "For methylene chloride, EPA is currently evaluating the proposal and regulation of this substance and its uses to determine the appropriate regulation." But as the nationwide rule has languished, some consumer advocates have taken a parallel route. The vast majority of consumers buy methylene chloride paint removal products at brick-and-mortar retailers; Drew purchased the product that killed him at the hardware store Lowe's. The chemical safety group Safer Chemicals, Healthy Families worked with the Natural Resources Defense Council and with families to pressure retailers to stop selling methylene chloride products. The Wynne family was among those writing letters to stores, trying to convince them to pull the potentially deadly products. In May, Lowe's announced it would discontinue the products. Home Depot, Sherwin Williams and other major retailers followed. In all, thousands of stores will stop selling methylene chloride paint removers by January. "In the absence of a federal regulatory driver, some retailers have started to step up and do voluntary restrictions on methylene chloride in paint strippers," says Gregory Morose, a research manager at the Toxics Use Reduction Institute at the University of Massachusetts, Lowell. That's good news for his research team; just last month, they announced a new, safer paint stripping chemical they say is just as effective as methylene chloride. They expect some retailers to start selling the new formulation in the next few months. Lowe's and Sherwin Williams declined to comment on why they decided to stop selling methylene chloride products voluntarily, or what paint stripper formulations they would stock in the future. Margaret Smith, a spokesperson for the Home Depot, confirmed only that the company "will phase out of paint removal products that contain methylene chloride and NMP by the end of 2018." Of course, without a federal ban, it's still possible to buy potentially deadly paint removal products at some stores. "The retailers that have committed — it's only a subset of all the retailers," says Morose. "A restriction by the EPA would be extremely helpful. There are just so many distribution channels for methylene chloride and paint stripping products." He warns that consumers should read the warnings on products carefully, and avoid exposing themselves to methylene chloride as well as NMP and a handful of other toxic chemicals, including toluene, xylene and naphthalene. And at least one state is considering its own methylene chloride ban. A bill introduced in Maryland this year would make selling paint removal products containing either methylene chloride or NMP a misdemeanor, punishable with a fine. "It was an easy bill to introduce, but not an easy bill to get passed," says the bill's sponsor, Clarence Lam, who is also a public health professor at Johns Hopkins University. "You know, the data and the evidence are there. But not everyone understands evidence and science." Plus, he notes, the chemical industry, "is very well funded when it comes to their team of lobbyists." Lam says he wishes he didn't have to pursue a state-level regulation. He and his fellow legislators have small staffs and limited time — being a state delegate is a part-time job. Ideally, he says, the federal government should be enacting regulations to protect people from chemicals. "I think a lot of folks don't realize that EPA, at its heart and at its core, its real mission is to protect the health of the public. It is a public health agency," he says. "The best possible outcome would be to have the EPA ban the use of these chemicals in consumer products." A previous version of this story incorrectly stated that the Environmental Defense Fund pressured retailers. In fact the Natural Resources Defense Council is the organization pressuring retailers. Both organizations are pushing for a federal ban on methylene chloride paint removers.